Shopping for a new computer monitor can be tough at times. Not only is it worth considering things like the size and resolution of the monitor, but you should also consider the tech it has under the hood — like whether or not it supports NVIDIA’s G-Sync. NVIDIA recently announced a driver that ensures that monitors with FreeSync work with NVIDIA graphics cards — but there’s an issue. Not all FreeSync monitors work all that well with G-Sync, meaning that shopping for a monitor can be even more complicated. Thankfully, however, there’s a way to avoid all the complications when it comes to buying a G-Sync compatible monitor: buy one from LG. LG has been testing its UltraGear FreeSync monitors to ensure compatibility with G-Sync, and with some pretty great results. Safe to say, with an LG UltraGear FreeSync monitor, you should get a high level of performance and smooth gameplay without having to worry too much about compatibility issues. For the uninitiated, G-Sync is essentially aimed at offering a smooth gaming experience while boasting refresh rates of up to a whopping 240Hz. Put more technically, when you run powerful games on your computer, sometimes your monitor and graphics card can get out of sync — resulting in artifacts known as “tears.” G-Sync, however, ensures that those tears don’t happen in the first place. There are other ways to ensure your graphics card and monitor remain in sync — but they’re not nearly as reliable. For example, you could use V-Sync, which essentially means your graphics card will send frames to your monitor at the monitor’s refresh rate, but that can introduce another artifact, called “stuttering” to your gameplay. In other words, G-Sync is really the best way to ensure gameplay as smooth as possible. 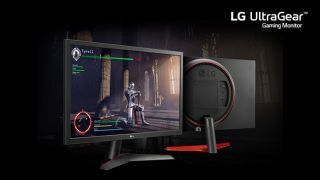 As mentioned, LG isn’t just telling people that its UltraGear FreeSync monitors support G-Sync — it also provided us with some concrete evidence. The company put a range of its FreeSync monitors to the test using graphics cards like the GeForce GTX 1060, GeForce GTX 1080 Ti, GeForce RTX 2080 and even the new GeForce RTX 2080 Ti. With those graphics cards, LG tested some of its most popular monitor models in its UltraGear series. LG tested the combinations of graphics cards and monitors with the game Monster Hunter: World, and found that in every scenario the monitors were able to reduce things like screen tearing and other artifacts. What that means is that you’ll still get benefits of G-Sync when using LG’s FreeSync monitors. As mentioned, a range of different monitors were tested, proving that the compatibility isn’t a one time thing. For example, there’s the LG 27GK750F, which has a 27-inch display and FHD resolution, as well as the 24GL600F, which has a 24-inch display and also FHD resolution. The company also tested the 32GK850F and 32GK650F which have 32 inch displays with QHD resolution and the 34GK950F which has 34-inch UltraWide QHD display also has been tested. G-Sync compatibility doesn’t mean sacrificing things like frame rate either. In testing, monitors reached frame rates of up to 59 frames with the midrange GeForce GTX 1060, and up to a massive 130 frames with the more expensive GeForce RTX 2080. On the RTX 2080 Ti, monitors achieved refresh rates of up to 173Hz. Those rates are more than adequate for high-performance gaming, and should make for a smooth experience all-around. Ultimately, it’s nice to see that LG has taken the initiative to ensure that its UltraGear FreeSync monitors work with G-Sync, while other companies will likely be a little more hit and miss. You can check out LG’s range of UltraGear monitors for yourself straight from the LG website, or from your favorite tech retailer.